Letterheads are a key part of many businesses’ stationery printing and are commonly used for direct mailing and advertising. Sending a letter using branded letterheads to your potential or existing customer shows you’re professional and also means you’re more likely to be trusted. Letterheads commonly have your company’s logo on the top, with contact and legal information at the bottom. You can be playful with a double-sided letterhead and create eye-catching designs on the reverse. Your letterheads & stationery printing can be printed both single and double sided. As with everything from Leeds Printing Company, standard delivery anywhere in the UK is FREE on our stationery printing. We also offer a SAME DAY DELIVERY SERVICE on certain items for a small fee. Delivery time for letterheads & stationery printing is 3-4 working days for orders placed by 16.30 with print-ready artwork. Why not order some Compliment slips also? Prices below for single sided, full colour letterheads. Prices includes VAT. Prices above are for single sided / full colour letterheads. Standard delivery time is 3-4 working days for orders placed by 16.30 complete with print-ready artwork. Price includes VAT. 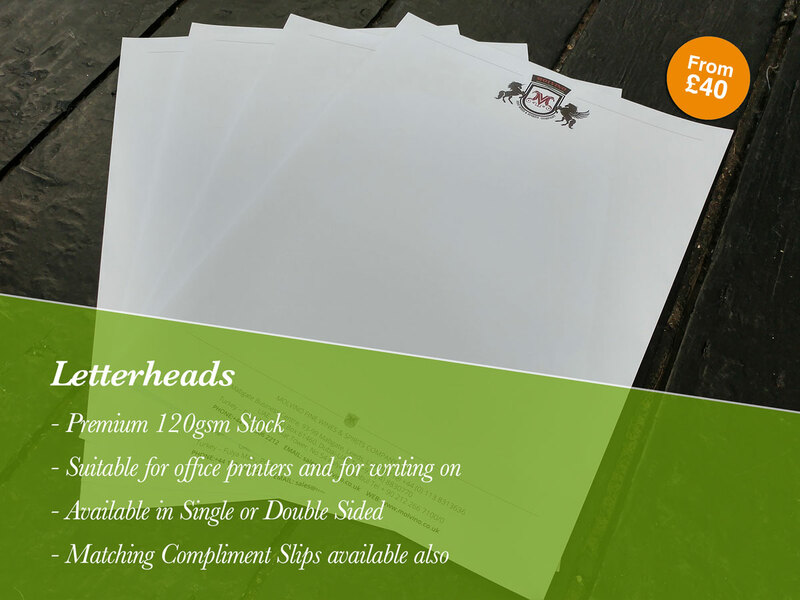 All of our Letterheads are standard UK size – A4 (210mm x 297mm). What Stocks do you print Business Cards on? Yes, all of our letterheads are suitable for printing and writing on.